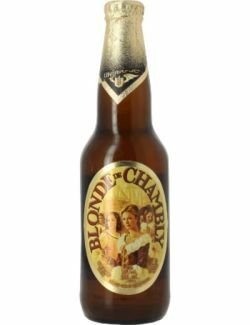 UPDATED: APR 14, 2019 341-ml bottle from a sample 12-pack bought at the duty-free shop in Quebec pours clear golden yellow with a half-inch soap-bubble off-white head and residual lacing; lots of visible carbonation. Aroma: honey, lemon, floral, biscuit. Flavor: lemon-honey cough drops, biscuit, banana, clove, coriander, melon, jack fruit. Mouthfeel: medium-bodied with a somewhat creamy finish. UPDATED: JAN 6, 2019 Belle robe dorée, mousse crémeuse et persistante. Nez sur les fruits mûrs, les fruits exotiques, les épices, la levure, les céréales. Bouche souple et ronde, agréable par son coté raffraîchissant et sa finale sur les céréales. Une Saison dans un style européen. Robe or pâle, voilée, mousse très abondante, grosses bulles, tenace, carbo très forte. Nez fleuri et légèrement acidulé, typé saison. En bouche, un goût de grain cru et un peu acidulé, citronné. Légère amertume, presque résiduelle, équilibre bien l'ensemble. Désaltérant et agréable, une saison sympathique. Bottle, [email protected] Bière. Pours hazy pale yellow with a medium, staying, frothy white head. Aroma has sweet malts, pepper, crisp, light doughy. Medium carbonation, fine dry and fairly light mouthfeel. Flavour has sweet malts, doughy, light herbal, grass. Fine bitterness. Okay. Bottle, 5%. Hazy golden with big off-white head. Aroma is malt, wheat. yeast, orange and spices. Flavour is malt, yeast. wheat, medium sweet, spices, orange, hop and a little bitter. My second one from the 6-pack. St-Feuillien being my reference, this is definitely the type of beer with orange and coriander, a nice refreshing Summer beer, but not my kind of saison. Very modest head, yellowish body with some fog. Funky sour grapes aroma, rotting lemon, coriander, odd overall. Heavy coriander flavour with a bit of wheaty dough. Crisp finish. Bready on the back end. Not too bad though a bit of an acquired taste.